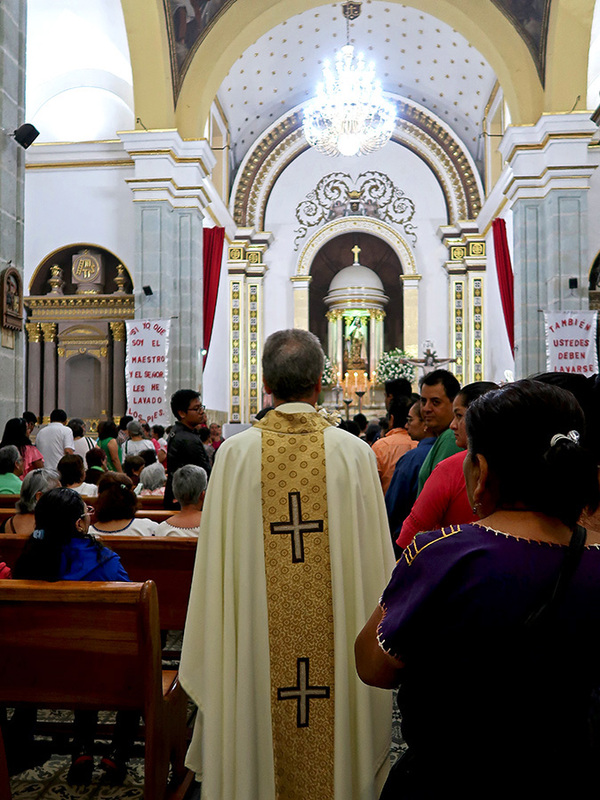 Last night I joined in the Oaxaca tradition of visiting seven churches (la visita de las siete casas) on Jueves Santo (Holy Thursday, Maundy Thursday). According to Wikipedia, “The tradition of visiting seven churches on Holy Thursday probably originated in Rome, as early pilgrims visited the seven basilicas as penance.” Last year I missed it, albeit for an excellent reason, as I spent much of Semana Santa (Holy Week) in Teotitlán del Valle with the family of Porfirio Gutierrez. 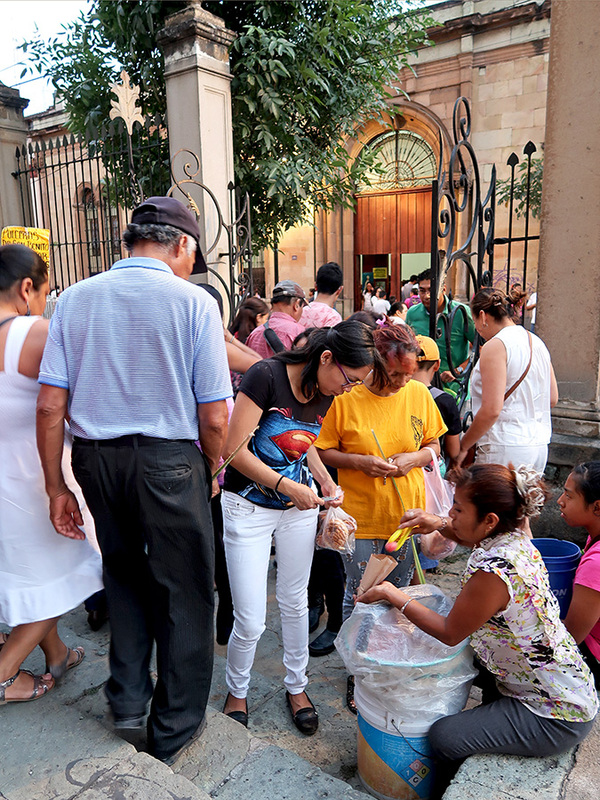 This year, my first stop was just around the corner at Templo de San José, where I bought my pan bendito from a couple of women selling small bags of the traditional blessed bread from a little table just inside the front door. The entrance to this church is small and it was crowded with parishioners trying to get to the mass that was in progress, so I opted not to stop to take photos. 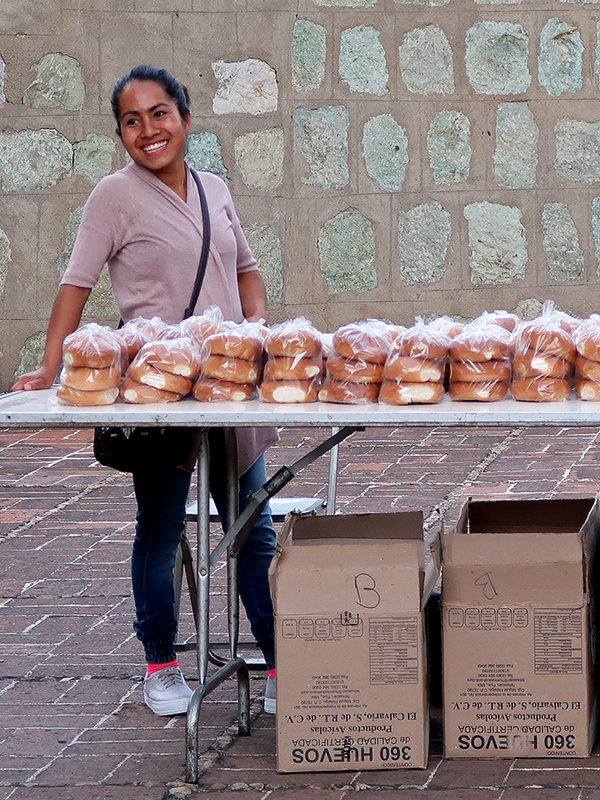 As I exited and made my way across Jardín Socrates (packed with people enjoying nieves), enroute to Basilica de Nuestra Señora de la Soledad, there were more blessed bread vendors set up in Soledad’s atrium. The doors to the Basilica were closed and the “traveling” Soledad was standing under a giant tent in the atrium. 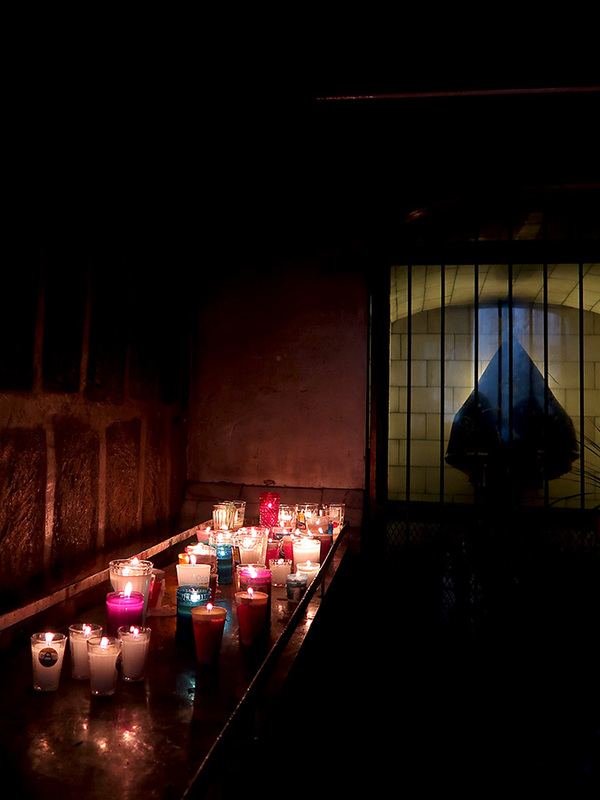 However, I followed the faithful to a tiny side chapel where a miniature image of Soledad appeared, behind iron bars and glass, like an apparition. 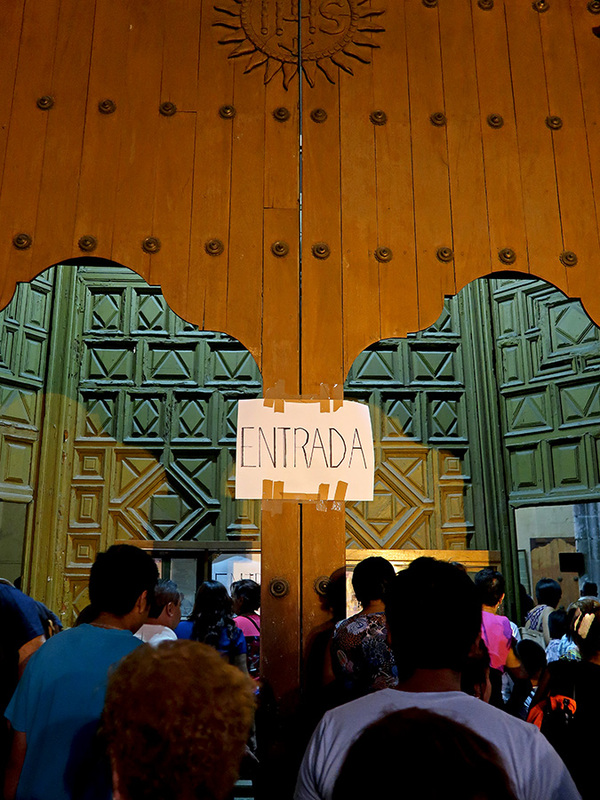 My next stop was along Calle Independencia — at Templo de San Felipe Neri, where I was met with gridlock. I joined the crowd in practicing patience and persistence as I navigated my way to the entrance, which was also serving as the exit — for some unknown reason the side door was closed. Less than a block away, my next destination was the Catedral de Nuestra Señora de la Asunción. It took almost ten minutes to wind my way through the masses of people (tourists, vendors, performers, and other Jueves Santo pilgrims) crowding the street and the Alameda. A mass was in progress and the pews were packed — even in the side chapels, it was standing room only. However, it was here, amidst thousands, I had the good fortune of running into a dear Oaxaca friend I hadn’t seen for many months. 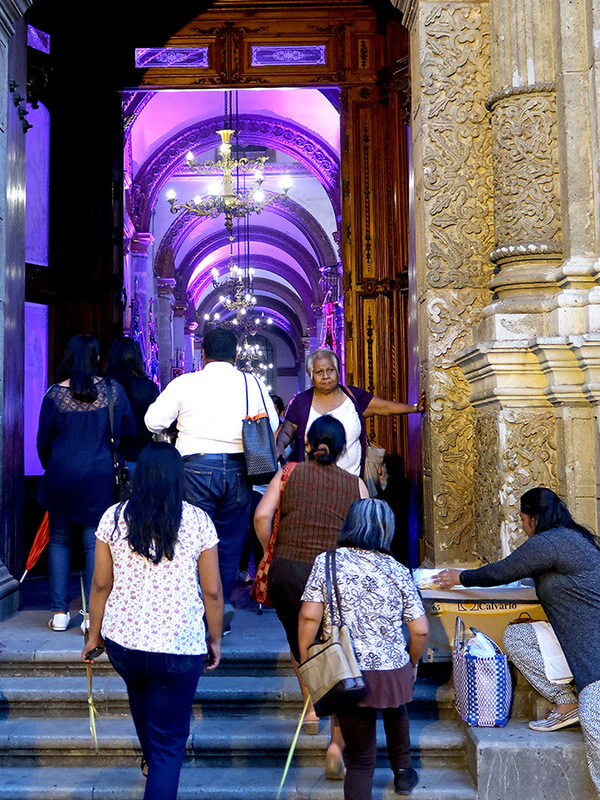 Leaving the Cathedral, I met the same foot traffic jam when crossing the zócalo to Templo de la Compañía de Jesús. However, once there, leave it to the Jesuits to have the entrada y salida (entrance and exit) logistics worked out! Exiting the “salida” door, I took a side street to avoid the zócalo and Alameda. By this time darkness had fallen, the uneven and potholed sidewalks had become even more treacherous, and so taking care not to also fall, I headed to Templo del Carmen de Abajo. Though not crowded, it too had separate doors marked for entering and exiting. And here, too, I ran into someone I knew — this time a new acquaintance from Palm Sunday in San Antonino Castillo Velasco. I couldn’t even get near the doorway of Santo Domingo de Guzmán, so I gave up on that visit and turned towards Templo del Carmen Alto and, on my way there, ran into one of my neighbors! Even when it’s filled with tens of thousands of tourists, it’s a small world in Oaxaca. 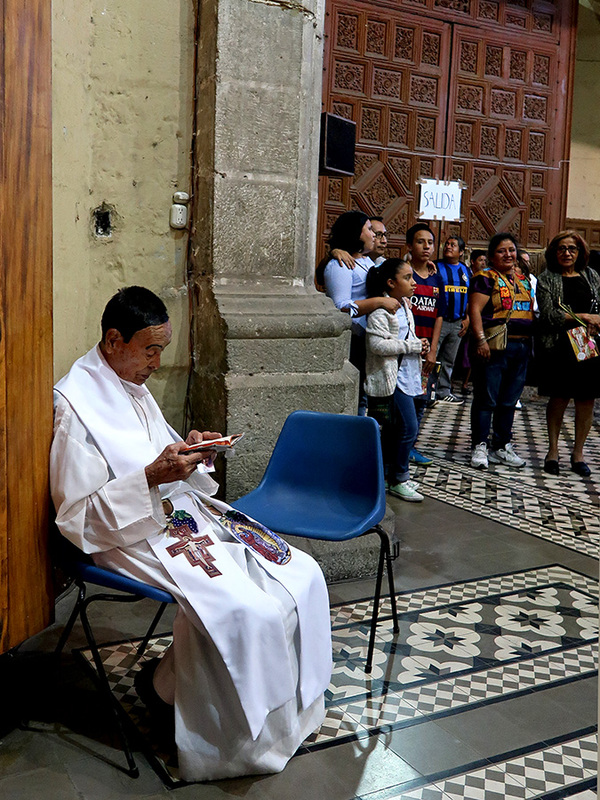 Once at Carmen Alto, I joined a throng of people walking down the main aisle, when a procession, led by an incense swinging altar boy, came up behind us asking for permission to pass — the gal behind me had a very close call with the incense burner. I had visited seven churches in seventy minutes and, by the time I left Carmen Alto, my feet were sore and hunger and home beckoned. However, I was left with warm feelings of having greeted friends and been out and about with the people of my adopted city.